Even though everyone had told me he wasn’t that far ahead and that I could catch him, I was not prepared for the kick at the finish. Honestly, what are the odds that in a four plus hour race it will come down to who has a faster kick for the last quarter mile. The chances are pretty slim, but it happened. It was the type of ultra finish I had dreamed of witnessing and to have been more than just a spectator to it and to have had the honor to share it with the caliber of athlete that I did left me downright giddy for weeks. 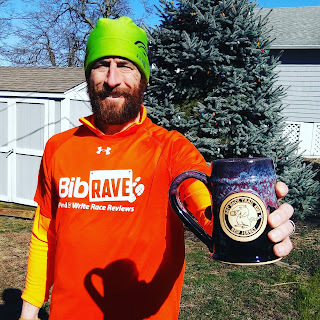 This is my story of the inaugural Rat Race 50k! The Rat Race trail runs have been an annual event for awhile; I only became aware of them last year. I ran it for the first time last year, opting for the longest distance offered, the 20k. This year the RD decided to offer a 50k option. I happily partook. In the past, both the 10k and 20k distances used the same 10k loop to reach their total distance. Until arriving at the race, I was expecting this to be the case with the newly offered 50k distance. To my surprise and satisfaction the RD had altered the course a bit for the 50k runners. Rather than five laps of the 10k loop, he added a longer 20k loop which was then followed up with three laps around the original 10k course. If you want a more in depth description of the 10k loop, go to my race report from last year on the 20k. As happy as I was to hear that I wouldn’t be running five laps of the 10k course, the added 20k loop to start was not 20k of completely fresh trail. In fact, about half of the large loop was the same trail as the 10k loop (see Strava map). And all of the added distance to the large loop was either fire road or powerline cuts, no new single track. I’m not trying to complain here, just making it clear that the 50k is for the most part achieved by running the 10k course five times. With this being my first race of the year, my primary goals were to test out my fitness level, get adapted to those pre race jitters before my “A” races, and have some fun of course. If everything went well, I hoped to set a new 50k PR (4:54:29) for myself as well. Why did I have such high hopes for my first race of the year? I went about training over winter completely differently in this past offseason than I have since I started running ultramarathons. I got myself a gym membership and started building up my mileage and doing some speedwork on the treadmill in January after light mileage in November and December. I’ve found that I enjoy a couple months of lower mileage to allow the body to recover and to avoid burnout after heavy training and racing. This year I increased mileage and intensity more quickly with access to the treadmill. 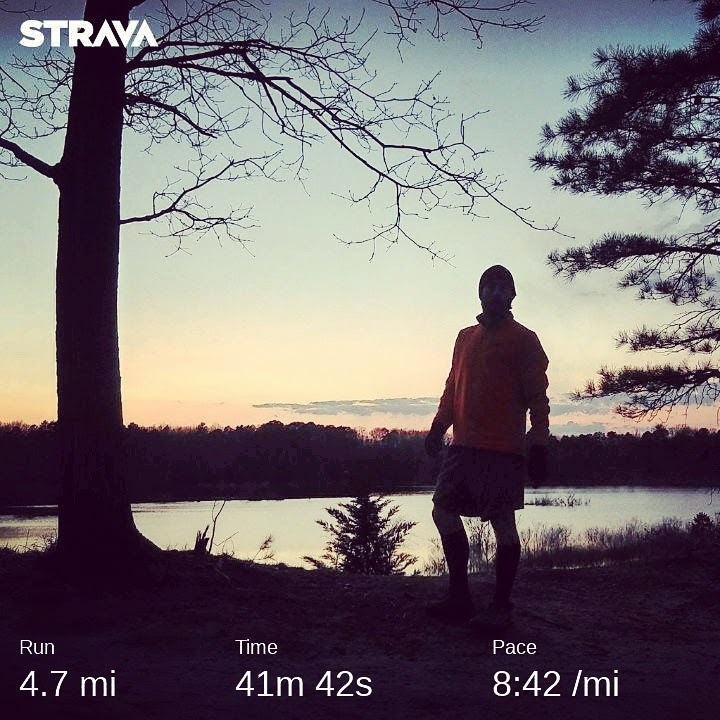 I wasn’t sure how well all of the treadmill miles would transfer to trail running, but I was excited to find out and hoped for the best results, a 50k PR. All set, ready to race! The week before the race the timing company sent out an email with a link to the entrants list. I scanned it to see if anyone I knew would be running the 50k. I didn’t see any names I recognized except for Rich Riopel. If you’re not familiar with who Rich is, in short, he is one of the best ultrarunners to come out of NJ. He has qualified for and represented the USA multiple years on the 24 Hour National Team to compete at the International Association of Ultrarunners (IAU) 24 Hour World Championship. If you want more evidence that he is an accomplished ultrarunner, just look at his Ultrasignup results. Why am I giving you all of this information about Rich? Well, he is a main character in my race report. As we all took off from the start the course started off following the same unpaved road that the 10k loop starts on. I was following Rich and one other runner when early on, probably a quarter to half mile from the start, Rich hops of to the side and begins retying a shoelace. I passed him at that point and expected to see him passing me within a couple minutes. 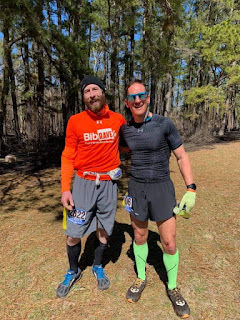 To my surprise, I ran with the other lead runner for a couple miles at what felt like a pace that I could maintain for the entire 50k and there was no sign of Rich. We were doing around eight minute miles and it was feeling good so I tried to maintain it knowing that the 10k loop was more technical than what I was running on this bigger loop. Other than some sandy sections, and even those were runnable, it was all easily runnable. I figured to meet my goal I only had to average 8:30 miles so I was trying to bank some time for the loops around the 10k course which I figured would be a bit slower paced. The 10k loop was a bit more wet than it had been last year and the wet spots were a bit sloppier and more treacherous than I recalled. Regardless, I made it around the large 20k loop and back to the start/finish at about 1:34 with only another 30k to run. A Strava Flyby screenshot of just before the final lead change of the race! Starting my first of three loops around the 10k course, I began to wonder what the heck happened to Rich. Did he drop? Was he just here for a fun run and jiking this 50k? These questions were answered about two miles later when he passed me just a bit before hopping on to the start of the single track portion of the course. I tried to keep up with for him a bit and soon realized he was in no way jiking this thing. With the curvy, heavily vegetated trails it didn’t take too long before he was out of sight. I was shocked to see him again just a couple miles later making his way back onto the trail. I assume he must have made a pit stop and he hopped back on to the trail just behind me. Having him right behind me and knowing that we were in the first and second at about the halfway point of the race lit a bit of a fire under me and I pushed a bit harder than I probably otherwise would have. We ran within a couple paces of each other for about a mile until the course pops off from the single track to a short unpaved road section again. At that point Rich cranked it up a bit and pulled ahead. I tried to give chase and kept him from pulling out of sight on the unpaved road section, but shortly after being back on the single track he was gone again. Going out for my second to last lap and knowing he wasn’t that far ahead I tried to push harder and earlier than I had intended. I could see him in the distance on the long straight fire road sections that start the loop, but as soon as we reached the single track again there was no sign of him. I tried to maintain my pace hoping that he may slow down and I’d have a chance to run with him again, but my other motivation to keep a good pace during this lap was completely unrelated to my race goals. My wife was running the 10k and with the staggered timing of the start times of the multiple distances if I had any chance to see my wife on the course it was during this lap. I was pushing hard during this lap in hopes I would get to see her and give a few words of encouragement. It was the first race she had run in a long time, her first trail race ever, and the first race we had run together in an even looonger time. It was great motivation for me to push, even more than chasing after first place at the moment, but to no avail. I wouldn’t see her until passing through the start/finish area for the final time. As I passed through the last time I was surprised at how encouraging the few people hanging out were. They were excitedly telling me that first place wasn’t far ahead and that I could catch him. One person even said he was only ahead by maybe a couple minutes. 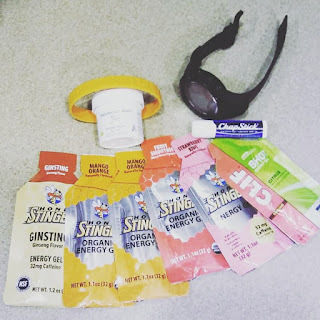 With that information and knowing it was my final lap, I ate my last Honey Stinger gel (I believe my sixth of the day) and pushed as hard as I could for the last easily runnable section of the course before the single track. I thought to myself that maybe I’d catch a glimpse of him on the long straight road, but nope. I held on to a bit of hope running the single track, but by the halfway point with only about three miles to go I had pretty much lost hope and started comforting myself by focusing on the positives. I was going to be able to pretty much cruise into a second place finish. I was going to set a new 50k PR with a finish time of easily under 4:30. From then on, my main motivation to not totally just coast in was to improve my PR by as much as possible and hang on to second place. I had lost all hope of catching up to first. All I need for a 50k. That is until about a half mile from the finish when I heard some grunting and heavy breathing from behind me. It was just before the little wetland section of the course around the lake where there’s a couple of single log pathways for water crossings. Basically a section that is unrunnable. I looked back initially thinking it was probably a 20k runner sprinting it in to the finish. I was shocked to see Rich behind me with a full head of steam sprinting to catch up to me. Shock quickly turned to a mixture of fear, confusion, and panic. I would have to run this unrunnable section and then sprint the last quarter mile or so if I wanted to have a shot at first which just a few seconds ago I had already thought a completely lost cause. 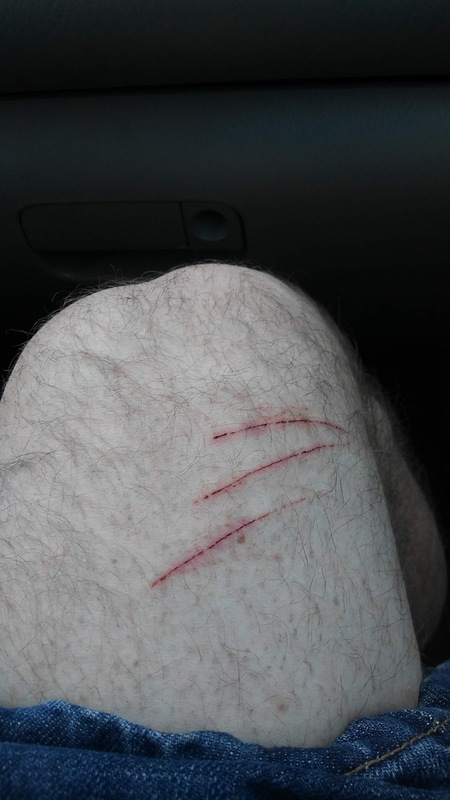 I tried my best to get across the logs quickly without falling and then going into any kind of a sprint that I had left. It wasn’t long after that the wet section that the trail widens then a quick left up a little hill and about a 100 yard dash across a grass field to the finish line. It was just before the left turn that Rich passed me. At that point I knew that I would have to give it everything to have any chance of keeping up with him. I was mentally committed, but my body wasn’t. My tired legs showed themselves as I tried to sprint up the little hill only to catch a toe, go down and skid on one knee for a bit before pushing myself back up onto my feet with both hands. It felt like only a second, but by the time I was back on my feet I knew I didn’t have a chance of catching him. He only had a few paces on me but I was moving like I had just run a 50k and he was moving like he was finishing a 5k. I was proud enough to at least continue to run it in as hard as I could even when I knew I wouldn’t be able to catch him. And amazingly, from the point just after my fall to the finish line was all caught on video by a spectator. In the end I finished in 4:15:24 just 10 seconds behind Rich. After congratulating one another on a ridiculously exciting ultra finish, I had to find out how it came to be. As it turned out, Rich had missed a turn about a mile from the finish and did an extra half mile or so. Sometime during that extra out and back he did, I unknowingly passed him. In retrospect, I can’t be disappointed with how the day turned out. I improved my 50k PR by almost 40 minutes! 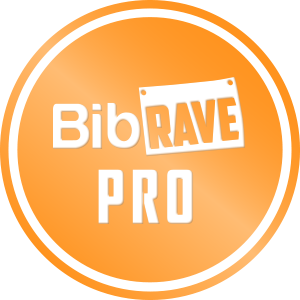 I raced a world class ultrarunner for much of a 50k to finish only 10 seconds behind him after a sprint to the finish. I mean, I could be super disappointed that I didn’t manage to sneak in with first place, but that wouldn’t be as much fun so I’ll stick with what has worked best for me in the broader scope of ultrarunning and be happy about all the positives. To celebrate March as “Women's History Month” and as the month that hosts International Women's Day, I decided to write short features on female ultrarunners that inspire me. 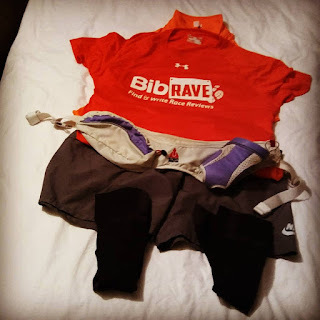 In the order in which I posted them, which in no way suggests greater or lesser importance of any, below are the features I put together on four amazing ultrarunners who happen to be female. I stopped at only four not for lack of material, but strictly only because of my personal time limitations. There are obviously many other female ultrarunners who have impressive accomplishments and stories that deserve to be told. So if any of the below runners inspire you, I encourage you to seek out further inspiration via blogs and vlogs of other female ultrarunners who are sharing their own story with us all. To celebrate March as “Women's History Month”, I will be posting what are hopefully inspirational posts of female runners that I find inspiring. To start I dusted off this meme I made a little less than a year ago, just a little late for last year's International Women's Day. None other than Courtney Dauwalter! Keep pushing those boundaries and helping us all learn what is truly humanly possible. Photo from IRunFar.com, “Ann Trason and the 1995 Western States 100”, 1994 Western States 100. I would be doing a disservice to all of the ultrarunning world and women in general if I failed to include the legendary Ann Trason as a featured female athlete to celebrate March as “Women's History Month” and International Women's Day. Where to begin with Ann Trason and her lengthy list of ultrarunning accomplishments. Let’s start with course records. Should we continue to World Records? If her records don’t impress or inspire you, maybe her persistence will. She DNF’d her first two attempts at running the Western States 100 (1987 and 1988) due to knee problems and dehydration respectively. Rather than giving up, she went back in 1989 and won the race. She went on to win it for the next nine years to achieve an unprecedented 10 year win streak. She won the race for an additional four more consecutive years from 2000-2004. Her course record (17:37:51) set in 1994 stood for 18 years. Did I mention that two of those Western States wins came less than two weeks after winning the ultra competitive 56 mile Comrades Marathon? Even with all of these accolades, it is likely that many people were introduced to Ann via Christopher mcDougall’s rather unflattering portrayal of her in his book Born to Run: A Hidden Tribe, Superathletes, and the Greatest Race the World Has Never Seen. Thankfully in recent years, through the work of content creators such as Billy Yang (see link to podcast/video), the ultrarunning community has painted a more complete picture of who Ann Trason is. If any of this captivates you, follow the links below to learn more about Ann Trason and her amazing ultrarunning accomplishments. Also linked to is my Mines of Spain race report where I tell my account of unknowingly sharing my final aid station stop with Ann Trason debating whether or not I should do a shot of Fireball. Photo from Candice’s website, Wild Defined (http://www.wilddefined.com/). The final female athlete to be featured and wrap up my weekly posts to celebrate March as “Women's History Month” and as the month that hosts International Women's Day is Candice Burt. If you haven’t heard of Candice Burt, then you probably haven’t heard of 200 mile races either. Sometimes referred to as the “Queen of 200s”, Candice is making the 200 mile distance a bit more of a standardized ultramarathon distance and probably as mainstream as it has ever been. I don’t say “ever will become” because I believe as much as Candice has already popularized the distance, it will likely gain further popularity in large part thanks to her efforts. Candice is the Race Director (RD) for and creator of three of what are arguably the most popular 200 or more mile ultramarathons: Tahoe 200, Moab 240, and Bigfoot 200. The bulk majority of all the miles for all three races is made up of primarily a single loop course design, making them a rarity even amongst most 200 mile or more races in the US which tend to rely heavy on multiple loops or repeated out and backs. 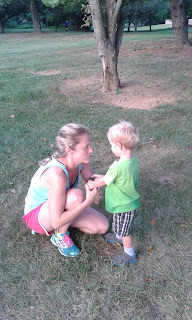 Candice’s races are a niche category within the niche sport of ultrarunning. However, with her attention to detail, focus on scenic and quality course design, and her intense marketing skills (#200IsTheNew100), Candice has built a following and demand for these types of races. Maybe her success as a RD is in part due to her broad experience as an accomplished ultrarunner herself. Candice holds the current unsupported Fastest Known Times (FKTs) for two routes: the Wonderland Trail (95 miles) and the Trans-Zion (48 miles). Additionally, with four HURT 100 finishes (4th F, 2nd F, 2nd F, and 3rd F) amongst a slew of other impressive ultra finishes on her Ultrasignup, there is ample evidence that not only does Candice know how to direct ultras, she also knows how to run them. 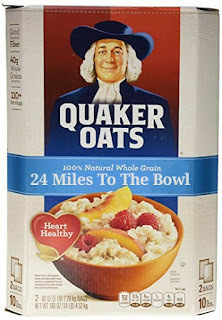 Twenty four miles on one bowl of oatmeal. Just this morning I finished what will probably be my last long run (24 miles on the treadmill) prior to my first race of the year, the Rat Race 50k. It felt good for having not run much in the last week due to work obligations and some family celebrations. I know a whole lot of people will disagree with my opinion, but it wasn’t that bad doing a long run on the treadmill. Especially since I have a pretty solid spotify playlist prepared just for such occasions. The other benefit of long runs on the treadmill is the ability to set the pace and stick to it mindlessly, which is what I had planned for this run. 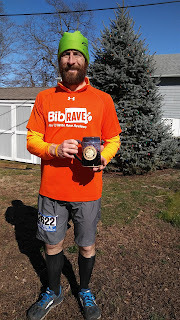 I ran the first 18 miles at my target race pace for the NJ Novo Nordisk Marathon, (8:30/mile) which would be under my marathon PR by less than a minute. After that I increased my pace slightly until the last 2 miles when I ran sub 8 minute miles. Being able to run 22 miles at my target pace without feeling like I was struggling at all and then being able to pick up my pace a bit at the end is a huge confidence booster for my PR goal at the NJ marathon. However, I still have my doubts about whether I’ll actually pull it off. Not because I don’t think the fitness or ability will be there, but because the Hyner 50k is the weekend before. And not just because the Hyner is a tough 50k with some big climbs, but because now that I’m committed to running the PA Triple Crown Series all three of those races (which begin with Hyner 50k) are my “A” races for the year. This means that I intend to not hold anything back at Hyner and if it goes well and there’s nothing left in the tank at the finish, I likely won’t be fully recovered after one week when I go for the marathon PR. Whether I blame poor planning or just myself for making stupid decisions doesn’t really matter because I’m not changing my plans regardless of how dumb they may be. The way I see it is if I do run a good time at Hyner and still hit my marathon PR goal it will just be that much more impressive. Additionally, it will likely motivate me to go for another marathon PR soon after in hopes that I could surely run a better time on fresh legs. Before I wrap this up, just a side note, or more so a bit of a humorous story. One of the earlier mentioned family celebrations was a trip to Great Wolf Lodge in the Poconos of PA. While this trip took some time away from what would have been dedicated training time, I still got on a treadmill to run at the Great Wolf Lodge resort. While it wasn’t a great work out or run, it was a pretty entertaining one. The fitness room is small even by hotel fitness room standards. And one of the three walls is made of glass windows along a busy hallway. This hallway is a pretty high traffic area between the water park, arcade, and a wing of the hotel rooms. Never before have I had more ice cream eating children stopping to stare at me running on a treadmill than during this treadmill run at Great Wolf Lodge. I’m not complaining about this. I actually found it pretty humorous at the time and still do. It was somewhat surreal as I kind of felt like I was an attraction at the resort with all of the attention I was getting. If you’re ever at a Great Wolf Lodge don’t totally blow off your work out if the weather is crappy, you’re slightly drunk, or just feeling exhausted. Find the fitness room and run some miles on the treadmill. It will entertain the kids roaming the halls and if you’re like me you’ll get a few chuckles from their fascination. Ah... 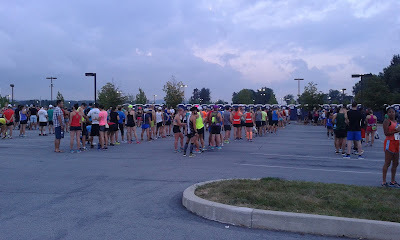 The porta potty line at the start of a road race, really makes you appreciate ultras. Author's Note: I wrote this back in mid 2018 just a few weeks after the Tahoe 200. After writing, I left it untouched until now (February 16, 2019) when I finally decided to post it. 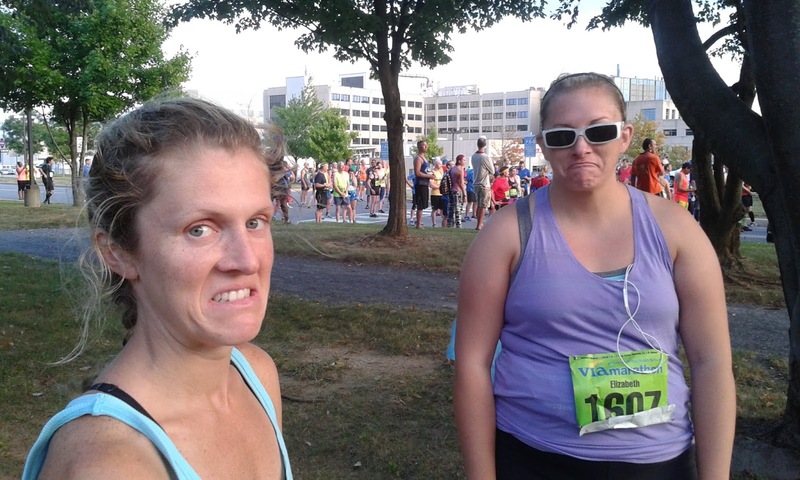 It was at some point during 2016, I don’t recall exactly when, that my wife announced t me that she wanted to run a marathon. These were some of the most beautiful words she ever said to me. I write that rather facetiously. She didn’t elaborate on what motivated her to want to run a marathon, just that she wanted to run one before her thirtieth birthday which would be later that year. My wife, Amanda, wasn’t a newbie runner, but she had not run as much or as regularly in recent years after having children as she had before we had kids. So hearing that she wanted to run a marathon wasn’t a completely radical or ridiculous idea, but it was still a bit of a surprise. In fact, Amanda was a runner long before I ever was and I credit her for me becoming a runner. I doubt that she ever thought that a passion for long distance running would burn so strongly within me once I discovered ultramarathons, but anytime she gets annoyed with my obsession I just remind her that she had a role in instigating this addiction. But this story is about her, not me. 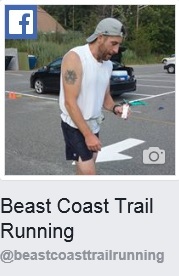 However, my obsession with ultrarunning plays a bit of a role in the story. 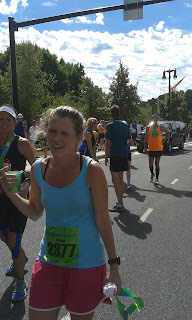 She decided on a marathon, the Lehigh Valley marathon in PA in mid September. If memory serves me correctly, this gave her roughly three months during the summer to build up her mileage base and improve her overall fitness level to get to a point where she would be able to enjoy the marathon experience rather than just struggling through it. After all, that was her main goal: to finish a marathon, not run it as a Boston qualifier. With this in mind she looked over training plans and asked me about my training. Ultimately, she followed a similar training regimen to what has worked well for me: HIGHLY FLEXIBLE! With two young boys at home, there aren’t many other options. She did her shorter runs when time allowed. Her longer runs were done on weekends incrementally increasing the distance. 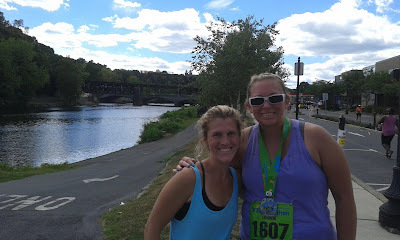 The training time seemed to go quickly for me at least and during that time Amanda enlisted a friend to run the marathon with her. Soon enough, we were meeting up with her friend at the pre race expo adjacent to the steel stacks in New Bethlehem, PA. The following morning I drove them both to the start and after some last minute goodbyes and words of encouragement from the kids and I they were off. Since this isn’t my race report and I wasn’t around to observe Amanda’s progress throughout the day, I’m going to gloss over her whole race experience and just report that she finished running it in. While she was busy running her first marathon, I was busy swimming with our boys at the pool of the hotel we stayed at. As much fun as they were having, we made sure to be at the finish in plenty of time to cheer her in. She made it there, looking a bit tired, but running nonetheless. Last photo before entering the start corral. bit shocked just a few weeks ago when she unexpectedly said she wanted to run another marathon. I can’t help but feel like I deserve some of the credit for motivating that desire. I in no way blatantly or even intending to push her in that direction. I was simply doing what I often do: following a race online. Specifically, the Tahoe 200. Likely, the majority of the credit for motivating Amanda to pursue another marathon should go to Courtney Dauwalter. Amanda usually doesn’t show much interest when I provide her unsolicited updates to ultras I’m live tracking and geeking out on. However, the weekend of the 2018 Tahoe 200 seemed a little different as I reported to her throughout the day that Courtney was still leading the field with a big gap between her and second. Towards the end of the weekend after Courtney’s epic and inspiring battle for first place overall, Amanda announced that she would like to run another marathon. So thank you Courtney for providing that spark to motivate my wife. Now I just need to come up with some great reasons why she should just go ahead and register for a 50k rather than another marathon. Any suggestions are welcome! I totally take back this meme I made a year ago. If you’ve been a follower of my blog, you’ll know that I’ve struggled with deciding what the heck I’m running this year. Well, I registered for the entire PA Triple Crown Series for the third straight year. With the decision made and me being committed to running the PA Triple Crown Series this year, I knew it was time to get serious about training. 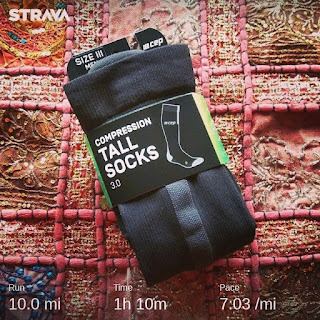 Whether I opted to run the series or not, it was time to quit giving in to excuses and start building up some mileage for whatever I decided I was going to run this year. In the past two years I felt like it wasn’t my overall fitness level that took away from my finishing time at Hyner, but rather the big climbs and my lack of being prepared for them. So, I intend to change that this year. I got myself a membership at the local Planet Fitness so I could start training earlier, lose less fitness over winter, and train on some incline rather than just running pancake flat South Jersey. I’m also putting in some time on that stair stepper machine thingie in an effort to help build the quads. My training for both years leading up to Hyner was pretty similar in mileage and terrain (see Table 1 below). Not surprisingly, my results were pretty similar as well. In 2017 and 2018 I finished in 5:36:36 and 5:42:02 respectively (race reports here 2017 and here 2018). This year has already been a bit of a change with the treadmill workouts allowing me to more readily and comfortably increase volume, mix in continuous 15% incline reps, and increase intensity. I feel these three aspects of training on a treadmill may work to my benefit as I concurrently train for Hyner 50k and the Novo Nordisk New Jersey Marathon. Table 1 shows my monthly mileage totals leading up to the Hyner 50k in 2017 and 2018. The first benefit of the treadmill training I’ve felt is just the ease of increasing volume. With January almost over I have about 180 miles for the month, a pretty big increase over last year. Surprisingly, it felt pretty painless to go from two months of lower than average mileage to a higher than average month on the treadmill. Maybe the primary reason is because I’m not a fan of cold weather running. And the main reason I’m not a fan of running in the cold is because the cold, dry air tends to trigger my asthma while running. I’m a fan of running for 24 hours in the heat and humidity, but once it gets too chilly I just can’t breathe which makes running miserable. And no, for the most part I don’t think of running for 24 hours as being miserable. The treadmill takes away the “sucky weather excuse” altogether for not getting a workout in which has helped me increase my volume of running this past month. I readily admit that I have fallen victim to using that excuse. After getting home for work, cooking dinner for the kids, doing homework, and getting the kids ready for bed it can be tough to be motivated to get out for a run in the dark even if it’s just cold. And if it’s rainy, cold, and windy, the “sucky weather excuse” sounds even better. Thanks to the gym and the treadmill, it’s no longer an excuse. The second benefit of the treadmill is the option to run some incline. Granted, the maximum 15% grade of the treadmill is nothing compared to the final climb (SOB) at Hyner, but it is still better than the average route I run in South Jersey. 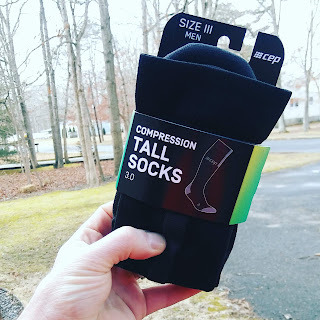 I do have a few areas I can run where there is the option of doing some short hill repeats, but I am not aware of any area in South Jersey where I could train on a long, continuous climb. A video showing the hills I use for hill repeats at the Egg Harbor Township Nature Reserve. The third potential benefit I hope to eek out of this treadmill training is more quality workouts with higher intensity. We’ve all heard the old phrase that “quality is more important than quantity” in many situations, including running. Heck, there’s even a podcast that plays on this concept (Ten Junk Miles). Although I would argue that there is no such thing as a “junk mile” as long as I enjoyed running it, I am also well aware that not all runs provide equal training benefits. For reasons I mentioned earlier (that whole asthma and not being able to breath thing) my cold weather runs tend to be at a much lower intensity than I can maintain during the summer months. Not only am I able to do some higher intensity runs on the treadmill, I’m able to do it in an extremely organized fashion. 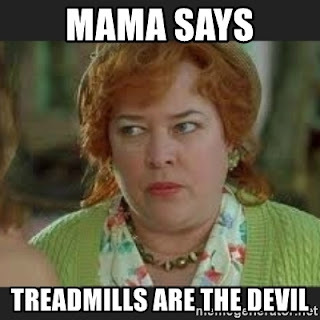 Whether it’s half mile high intensity followed by a half mile recovery or three quarter mile easy pace with quarter mile sprints, I just set the treadmill and run it. So, what does my treadmill incline workout look like? I set the treadmill to max incline at 15% for a mile which should be 792 feet of gain. I do three sets of max incline after three faster sets of 5 miles at 1% grade (264 feet of gain each). If my math is correct it puts me at a total gain of 3168 feet. 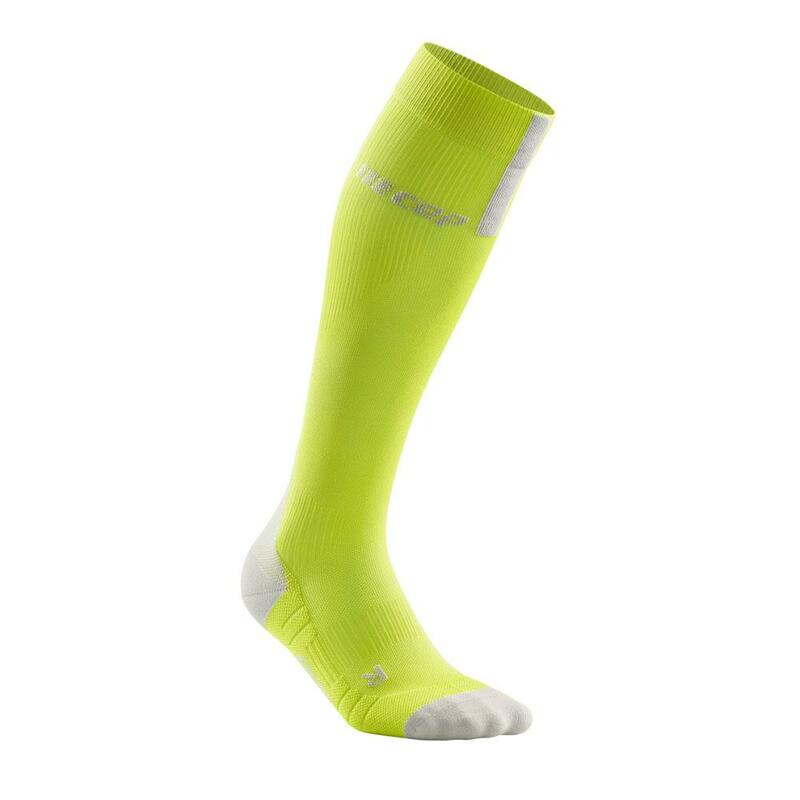 Which I’m hoping will have me better prepared for the 7500 feet of gain at Hyner in April that has been a major shock to my quads for the last two years. A video showing how I feel on the treadmill. So after much waffling and indecision, when the opening hour of the Eastern States 100 registration was upon us last weekend, I decided that again for the third consecutive year I would go all in on the PA Triple Crown Series. A few days later, I stumbled upon a last person standing event, Ragged Runner, in CT not too far from home in NJ. It is only two weeks after Worlds End which is not ideal, but as much as I have wanted to run a race that used this format I couldn’t resist and registered within a couple hours of learning of the event. And with that decision, my 2019 race schedule is for the most part pretty much planned with the exception of a longer fall race. I’m considering Beebee Farm 48 hour or Black Forest 65ish miler in PA. Since one of my 2019 goals is to run my longest/farthest run ever, I’m leaning towards Beebee Farm 48 hour since I think I could accomplish that there. However, if I happen to accomplish that goal at Ragged Runner (last person standing) in June, I may opt to close the season with midnight stroll through Rocksylvania and just run the Black Forest in PA.